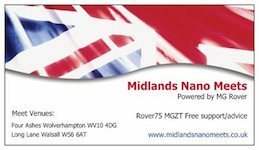 Related topics: Meets, my 75 meets mg6 (sorry about the poor photo's), Midlands Nano Meets, Thought it looked familiar, New Midlands Nano Meets Website & Forum Now Live ! Cannot see a problem with this. I am going to the Yorkie meet tomorrow and my presence hasn't been refused yet. I am after all the same JohnDotCom which ever way you look at it, no I'm afraid I haven't improved. Will just have a different window sticker on the back of car. ....and may I say what a good job they do to. I have had the pleasure of attending the Yorkie meet today and the Nano meet a couple of weeks a go. The atmosphere and friendship is really excellent and I think any making them "Official" will ruin them. They are arranged by very caring members for.........members. I hope there will be, I'm a bit lobsisded at the moment. A meet is just a meet, I do VW shows and there are dozens of clubs turn up, same with the Scooter meets. You can have things like inter club Tug-o-war, or best turned out club prizes, best club display or furthest travelled member trophies the possibilities are endless. Or we could all ignore each other, but that's not very productive is it? i organise a fair few meets and want to reach as many owners as possible so intend to post dates on both forums until someone tells me otherwise, i must admit though that running 2 lists will not be ideal but we will have to see how it goes in practice. In theory we could have an owner put his name down on both lists but with different usernames so one attendee can be mistaken for two, so we will have to remember, for now at least, both user names and a real name which should be fun when meeting owners " hadnt you used to be........." " Yes and i still am but you can call me............"
Trebor wrote: i organise a fair few meets and want to reach as many owners as possible so intend to post dates on both forums until someone tells me otherwise, i must admit though that running 2 lists will not be ideal but we will have to see how it goes in practice. I'm sure we can work it out to everybody's advantage Rob. As we mostly all know each other by first names, good idea to include in lists for meet. I quite like the AKA business as well, if using different names on different forums. Just adds a bit more to the fun. You'll never hear from us that you can't cross post to the Owners Club forum or any other forum. It's about the members and the cars, wherever they choose to spend their time. Mick AKA Grey Ghost AKA GG AKA mmcomputing AKA MM and a few others. I'm still short and getting shorter with age. Not so grumpy any more. I wonder why?